Of course I couldn’t do it forever. But there were things I really appreciated about my time in Exuma, not all of which I had expected. 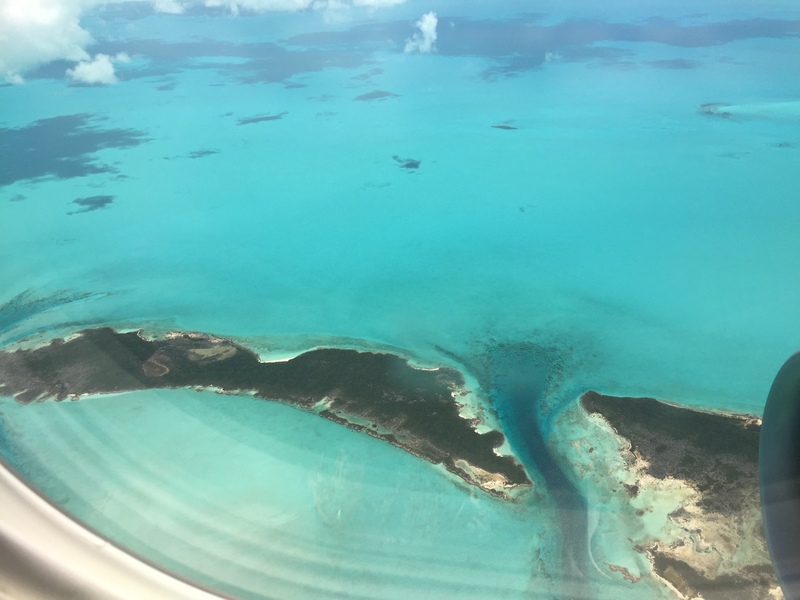 As you fly into the Bahamas (the name comes from Baja Mar… shallow water) the slender relationship between sea and land is striking. There are hundreds of islands – from the bustle and teeming tourists of Providence to rocky outcrops home only to a next or two. And between many of the islands there is sand in the shallows of the clear water – a tall man could walk between them with no need of a boat. Somehow this removes the potential claustrophobia of a small territory, the country feels the size of all of the islands in their beautiful scatter of startling turquoise – rather than any individual piece of land. As well as the natural beauty I loved the freedom from thinking about security. I didn’t lock the car all week – or even close the windows. Same with the house. In fact when we arrived and there was nobody there to meet us we found that all the doors were open anyway. I loved just walking out of the house and jumping in the car to fetch some milk and bananas – keys in the ignition saving me the carry-on of finding them before leaving the house. Or of finding sweaters, umbrellas, maps. A country for spontaneity – the fewer the barriers between notion and action the better in my book. I appreciated the extensive lack of traffic too. Being able to just stop by the side of the road – to buy something, to walk to the beach, to pick coco plums from a roadside shrub. No parking restrictions, no parking bays, no matter. And the casual ride-hitching. I took a trio of giggling boys a few miles along the road one day. They were shy about making conversation but very correct in their thanks at the end of the ride. Another day we transported an old man off to do his marketing a few miles along the Queen’s Highway (I wonder why they named it? It is the only road so scarcely merits the distinction of a title). There are no buses so this kind of sharing economy makes sense. Needless to say the sunshine is an upside. Having been raised to believe a day at the beach meant bracing myself for the deep chill of the North Sea at Whitley Bay, a warm sea is a source of constant delight to me. And its colour makes me squeal with delight every time I saw it. Even after a week it still takes my breath away. I love that gradual colour change from turquoise to sand. Partly an aesthetic thing but also it touches me and gives me a relaxing sense of peace. The relaxing can be deceptive. I was basking one afternoon, floating in the warm shallow waters and drifting into a meditative trance, when suddenly I was grabbed under the arms and dragged backwards. “Shark! Shark!” cried my companion – a local who had been born and raised on the island many years before. My first thought was it was an elaborate prank (my son had done something similar to me a couple of days earlier – purely for his own entertainment though he claimed he was educating me in taking better care of myself). However from the safety of a rock on the shore I could indeed see the 5 foot long lemon shark gliding stealthily around only 3 or 4 metres away. The sea must have been about thigh deep and was completely clear – what the locals call white water (safe) rather than dark water (potentially dangerous). “He can smell you” explained my friend, “they smell pheromones.” After that I was a lot more vigilant when out swimming on my own. The house we stayed in for this short visit was lovely but I think I would also be happy with something pretty simple. I read the details of a studio cottage for sale and teased myself with the idea Front porch, sea view. Could imagine myself there with my laptop, occasionally sweeping the sand back out to the beach. I need beauty more than I need luxury and that could just as easily be a wooden chair or two. Or the infinite luxury of a sparkling sea and star filled sky. 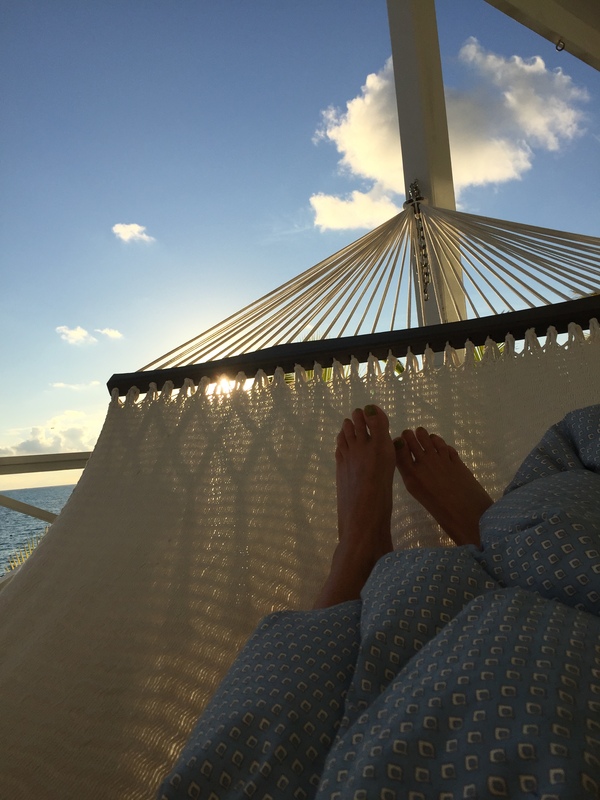 Some nights I slept in a hammock, sung to sleep by the waves, soothed by the soft breeze. One night a storm woke me, rocking the hammock enough to startle me out of my dreams. I was under cover so stayed dry as I watched it rage across the sea. At the end clouds of thunderflies emerged and I withdrew further under the blanket to avoid their tiny stinging attacks. The skies cleared and seemed washed by the storm – even more stars visible than had been earlier. The milky way, stars within stars, stars between stars. I texted a friend to share the experience and commented on how, in all these years, I have never seen a shooting star. Send me one I chanced. And within a couple of minutes there it was, my first shooting star. Seen from a hammock on wild night on a beautiful island. So then if I stayed longer, my question, as always, is with whom would I have conversations? There are poets and philosophers everywhere, so maybe I could ferret them out. I wouldn’t want to go there and just vegetate. Well I say that now, but maybe after a month or two I’d have forgotten and just slipped into a pina colada and sun fuelled stupor. I don’t think my friends would let that happen though – someone would fly out on the pretext of giving me a good shake and reminding me I had a brain and a conscience and things to do in the world. Maybe the sun and the sea would bewitch them too. Some aspects of the island were tragic. I saw so many abandoned farms, abandoned hotels, abandoned houses. I talked with the locals about young people leaving the island (of course they do, in their droves) , about the economically de-stabilising impact of the peak in drug trade a few years ago (pushing prices up in the heyday then leaving a gaping hole after the decline). Most of the businesses I interacted with were run by foreigners. I asked about that too… apparently the locals have no capital. I’m sure that’s a factor, though the relaxed state of mind also engenders a passivity that verges on disengagement with their own future. If I were living there I’d find it hard not to try to activate people all the time! The perfect plan, I reckon, would be 12 months. More than a visit, less than a life. A commitment to the experiment, to being there long enough to have to deal with things and not postpone them because I’m about to leave. Long enough to see what happens to me in that context over the longer term. But with an exit strategy. My year of island life maybe. Could even be part of a series of years – samples of other lives. Think I could do it? Could you?